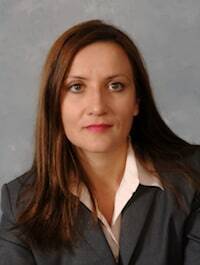 Chicago-Kent College of Law, Illinois Institute of Technology (J.D., Chicago, Illinois)(2003); Center for Conflict Resolution, Certified Mediator (2003); Sofia University Climent Ohridsky, Sofia, Bulgaria (B.A. and M.A. English Language and Literature). Sofia Zneimer practices in the area of business immigration and litigation and has represented multi-national corporations, individual investors, hospitals, non-profit organizations and business entities before the Department of Homeland Security, the Department of Labor, the Department of Justice, and the State Department. She also litigates before the Illinois courts and the Northern District of Illinois. Before joining Zneimer & Zneimer, P.C., she worked as an immigration attorney for a national law firm. Before this she was the Immigration Specialist of a Fortune 500 Company for several years where she managed the processing of all immigrant and non-immigrant employment-based visas, intra-company transfers, I-9 compliance, as well as the company's relationship with outside immigration counsel. During law school Ms. Zneimer held a judicial externship with the U. S. District Court in Chicago and also interned with the Department of Justice as a judicial intern with the U.S. Immigration Court in Chicago. Ms Zneimer was a Notes and Comments Editor of Chicago-Kent Law Review and is a member of the Order of the Coif. She is a Certified Mediator by the Center for Conflict Resolution in Chicago. Ms. Zneimer speaks on immigration issues before business and trade groups about strategies for successful processing of immigration matters including labor certifications using the Department of Labor's newly implemented "PERM" program.